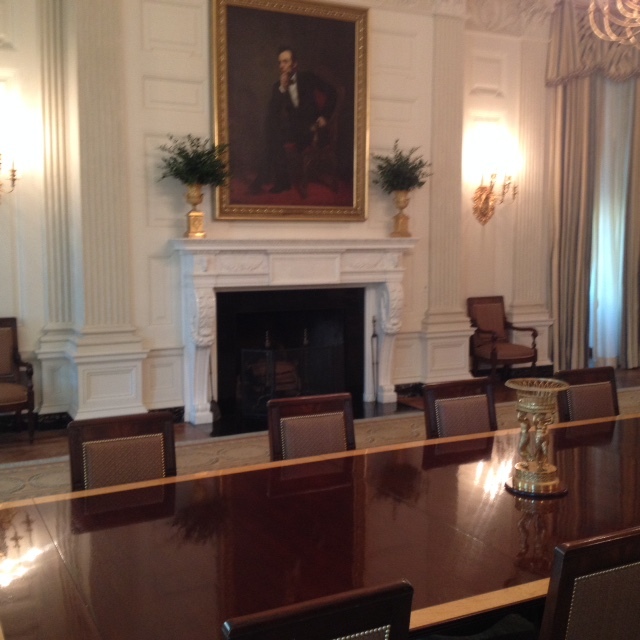 This is a picture of the White House East State Dining Room I took while on a tour of the presidential mansion with my wife on September 30th, 2017. We were doing the tourist thing in Washington D.C. but we weren’t just paying attention to the monuments and buildings. We were looking for as many hints and glimpses of the Christian faith that the average Separation of Church and State activist would swear just isn’t there. A hundred and forty years later FDR became aware of it and ordered it engraved on the fireplace’s white marble mantle. My ambition when visiting the WH was to find out if it was really there. Was it in plain sight, maybe even a conversation topic, or perhaps just ignored for all these decades? We found the dining room roped off to where you couldn’t get any closer than perhaps 40 feet from the fireplace. Sadly there was no way to see any writing on the mantle if it was there! So, I approached the uniformed and very armed Secret Service agent in charge of the room asking if he knew of any writing on the mantle. He answered that he did then asked me if I knew of what should be there and what I knew about it. I told the story about the prayer and FDR then he did the most incredible thing. He asked me if I was at the WH alone, which I said I wasn’t. He asked me to call Christy over which I did. I was beginning to think: “Agh oh! Have I been causing what could be considered a disturbance? Am I in trouble? Are we in trouble? So, when Christy joined me to our astonishment and that of the dozens of other tourists who were watching, he took down the barrier rope we were standing by. The declaration of “off limits” that thousands of ordinary folks who tour the WH daily are confronted with was being relaxed just for us. He invited the two of us to step into the segregated area then re-closed it and escorted us to the fireplace mantle to see it up close. We were a bit taken aback but didn’t hesitate a second. Yes the engraving was there. The story was true. FDR, the icon of a political party, that if he was alive today wouldn’t own him, ordered it there and there it was. Was it the age or just the color of the marble that made it impossible to see unless one were looking for it as close as a few feet or shining a light on it? Christy had the better phone camera so she took the best pics she could but they’ll need photo shopping to draw out the engraved wording so I can post it in the near future. Up close we saw it for ourselves, another historical statement of faith from 217 years ago that today is either ignored or innocently unnoticed. 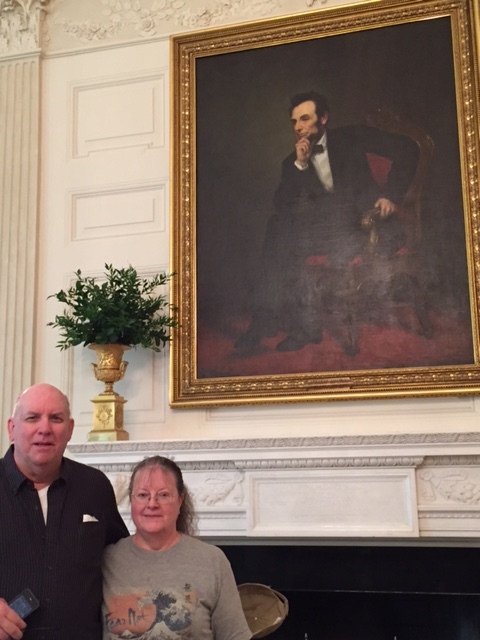 As a bonus the SS agent took our pictures next to the the mantle under the portrait of President Lincoln too. Think about all the youngsters who are never taught about such things by people with a certain “world view.” Think about the message the world ought to be exposed to that at least one secret service agent cared to share with “us” the general public. Maybe he was a Christian. Maybe due to the nature of his job he isn’t allowed to vocally point out anything in the space he protects, only to secure it from abuse. Maybe he was just an honest history buff and is given the prerogative to make exceptions of who crosses into that roped off area from time to time. I guess we’ll never know but we went away feeling privileged. We also went away with another precious measure of assurance that people of the faith were running things in the infancy of our nation, in the mid- 20th Century and as recently as the day we were there facilitating those like us seeking that assurance.